A Dragon Wagon in GTA Chinatown Wars. 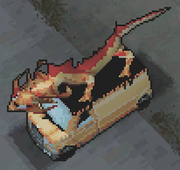 The Dragon Wagon is a delivery van is featured in Grand Theft Auto: Chinatown Wars. It is arguably the best van in the Grand Theft Auto series and perhaps one of the most damage resistant vehicles. When the Dragon Wagon is entered, it automatically starts the Noodle Run side mission. The Dragon Wagon is a modified yellow Burrito with a large dragon prop on the roof. It is used by a Chinese noodle company to deliver noodles to their customers, rivaling Noodle Express. The van has superior handling and its top speed is high. The van is also extremely durable; it is able to withstand up to three rocket hits without exploding. This makes the van one of the more durable vehicles in the game. Cerveza Heights, Dukes - On the block between Wu Lee's restaurant and a gas station. Chinatown, Algonquin - One block southeast of Hsin Jaoming's penthouse and one block southwest of the Chinatown Safehouse. A rendering of the papercraft "Sum Yung Gai Noodle Van" from the GTA Chinatown Wars section of the Rockstar Games Social Club. 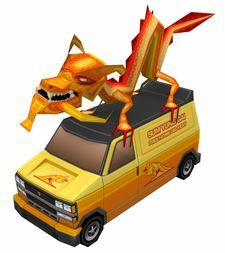 Under the "Chinatown Wars" section of the Rockstar Games Social Club website, members may download a printable papercraft model of a "Sum Yung Gai Noodle Van", the equivalent of the Dragon Wagon. The design of the papercraft van implies that the vehicle belongs to Sum Yung Gai. Pizzaboy and Noodleboy, two delivery scooters. This page was last modified on 7 November 2010, at 08:15.